'Jeannie was built by North American Aviation in Inglewood as a P-51D-15-NA, Army Air Force serial number 44-15651. It was sold as surplus in 1946 to Steve Beville and Bruce Raymond who raced it as 'Galloping Ghost' NX79111. ''Galloping Ghost' #77 flew in National Air Races in 1946 -49 and at the Miami Air Races, winning the Timmerman (1948) and Kendall (1949) Trophies and placing second in the Thompson Trophy (1948). It passed through a number of hands before Cliff Cummins bought the airframe for restoration in 1963. Cummins' modifications included fitting a low canopy and clipping the wings and he raced it as 'Miss Candace' #69 at Reno in 1969-1970. Following an accident it was rebuilt again with an even smaller canopy and a shortened radiator intake. He then entered it in the National Air Races in 1972-73. In 1979, Cummins set a new qualifying speed record of 446.93 mph. The next year, Wiley Sanders bought the aircraft from Cummins and renamed it 'Jeannie' #69 for his wife. 'Jeannie' enjoyed a winning streak taking gold in the unlimited class at Reno in 1980 and 1981. Sadly, 'Jeannie' failed to qualify in 1982 due to engine problems. Sanders subsequently sold NX79111 and it flew as 'Specter' #X, 'Leeward Air Ranch Special' #44 and finally 'Galloping Ghost' again, but with race number #177. Tragically, its final owner, Jimmy Leeward, died when 'Galloping Ghost' crashed at the 2011 Reno Air Races following the loss of an elevator trim tab. Historically, NX79111 is important as it pioneered the slim, cut down upper decking and canopies that became known as 'Turtledeck'. It established the format that was futher developed from the seventies to the present day. 'Jeannie' and 'Stilleto' relied on simple internal catches for the small canopy, while more elaborate hinged types followed. 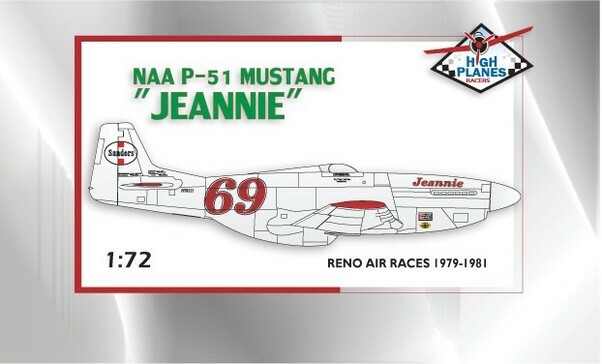 The High Planes Models kit includes the Airfix injection moulded plastic, Falcon vacformed canopies, resin parts for the fuselage and deck modifications and decals for Jeannie at Reno in 1979,1980 and 1981.